Shout! Factory has announced that they will be bringing the Rutger Hauer-starring A Breed Apart to blu-ray on June 26th. 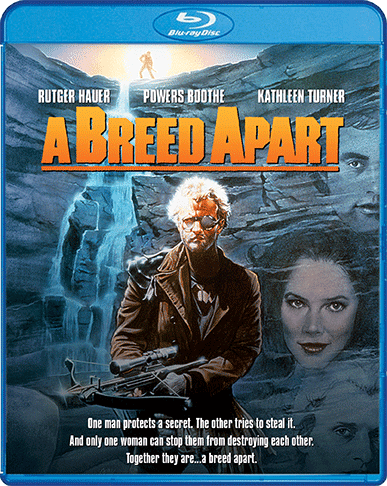 Deep in the rugged Blue Ridge Mountains, Jim Malden, a mysterious and dangerous recluse (Rutger Hauer, Blade Runner, The Hitcher) guards a secret with his life. When an adventurer (Powers Boothe, Southern Comfort, Sin City) dares to steal that secret, Malden's old flame (Kathleen Turner, Body Heat, Serial Mom) is the only one that can stop the savage war that is about to rage. This tense action-packed thriller from Philippe Mora, the director of The Beast Within, also stars Donald Pleasence (Halloween) and Brion James (Blade Runner). There are no special features listed at this time, but we will update you when they are announced. The blu-ray can be preordered at Shout! Factory's website where Shout! ships out their product two weeks before release date.